Full dossier after the jump. I just wanted to pass along some info I have learned about the X6. I live in the upstate area of South Carolina, home of BMW Manufacturing. My son is classmates with a friend who's dad is a test engineer at BMW. This gentleman told me BMW is currently building 9-13 preproduction prototypes each week. Most are used in testing with the balance being used to get the build quality correct. My contact would not give a specific launch date. The first 1,000 or so "out the door" new models will be stored and sent out for same day delivery to all of BMW's dealers coast to coast. My contact recently completed a 10 day test cycle with 7 preproduction X6's. It involved over the road testing as well as BMW renting both the Talladega and Daytona Superspeedways for multi day testing.The tracks were used for wind noise, tire noise, NVH, and overall high speed handling testing. My contact had the X6 over 150 MPH on several occasions around Talladega. My contact would not bite on what the engine options on the X6 will be. He would not say much about the make up of the interior. He did say the X6 will have a torque meter as part of the instrument cluster. The torque meter will showcase BMW's new "Dynamic Performance Control" rear differential. Similar to Acura's SH-AWD and torque meter found on the RDX and MDX. 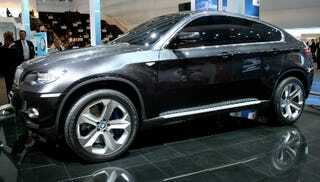 He also confirmed "M" versions of both the X5 and X6. He also said the South Carolina BMW plant has a good shot at building the new PAS-Progressive Activity Sedan even though that concept is based on the 5 Series platform. BMW is tight on worldwide manufacturing capacity.